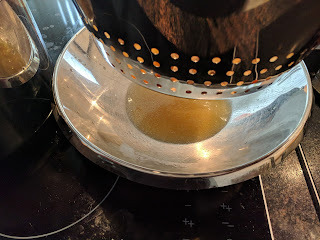 Another super easy and super fast recipe, or rather technique, using the pressure cooker to create a rich flavorful chicken stock that is remarkably clear and clean tasting. This is a result of the fact that in the pressure cooker the stock will never actually boil. Different from our Brown Chicken Stock, in which bones and carcasses are used, blond chicken stock is made using fresh chicken pieces or a whole chicken including the bones. 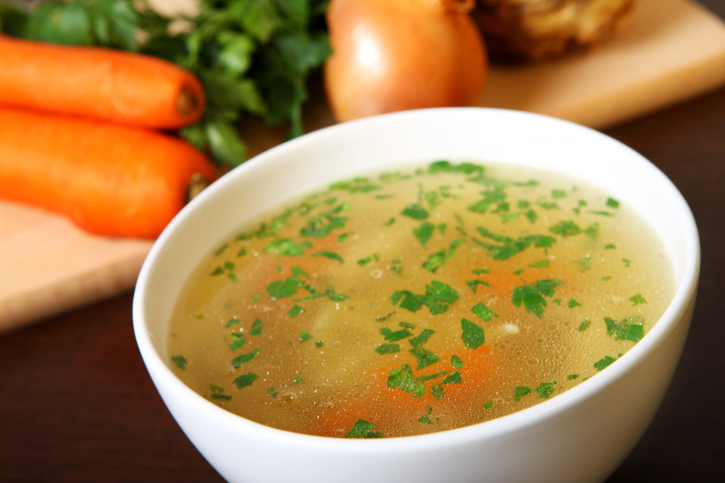 Again we are using very few ingredients compared to a classic chicken stock for two reasons. 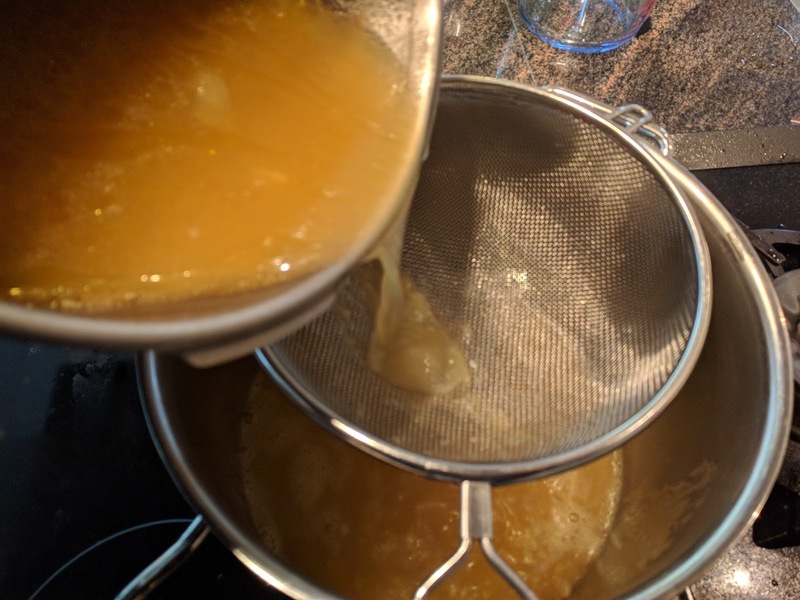 First, we want to keep the taste of the stock clean so it is as versatile as possible and we can use it in all kinds of dishes. Secondly, the pressure cooker method concentrates the flavors. As a result, if we would add e.g. leeks, parsley, celery, garlic, peppercorn and so on to the recipe, we would get more of a chicken/vegetable stock in stead of the desired clean chicken flavor. For those reasons, we also do not add any salt to this stock. 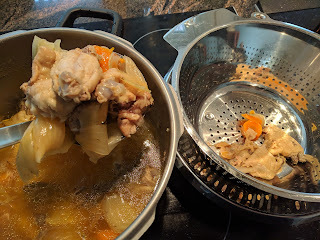 We used a mix of chicken wings and -legs for our example. 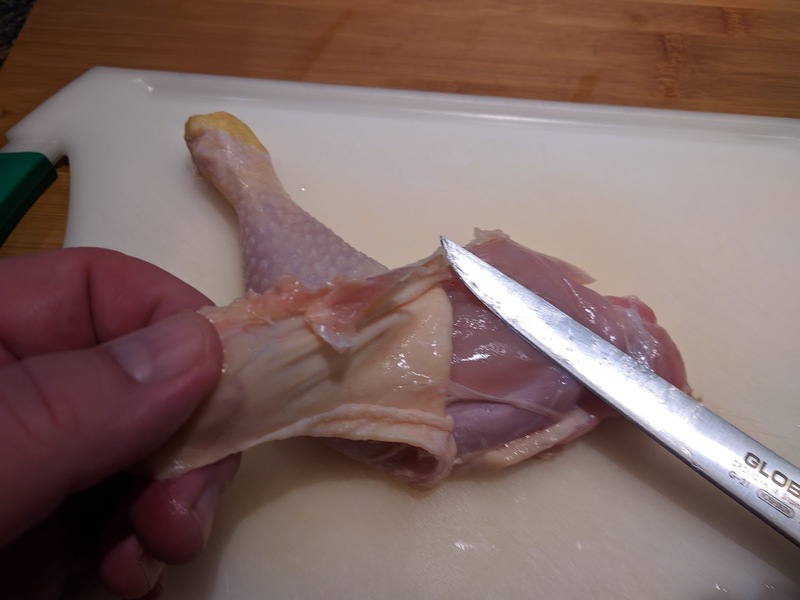 As the wings have comparatively a lot of skin, we removed the skin from the legs to reduce overall fat content. If you are using a whole chicken, you can leave the skin on as the ratio skin/meat/bones is exactly right. 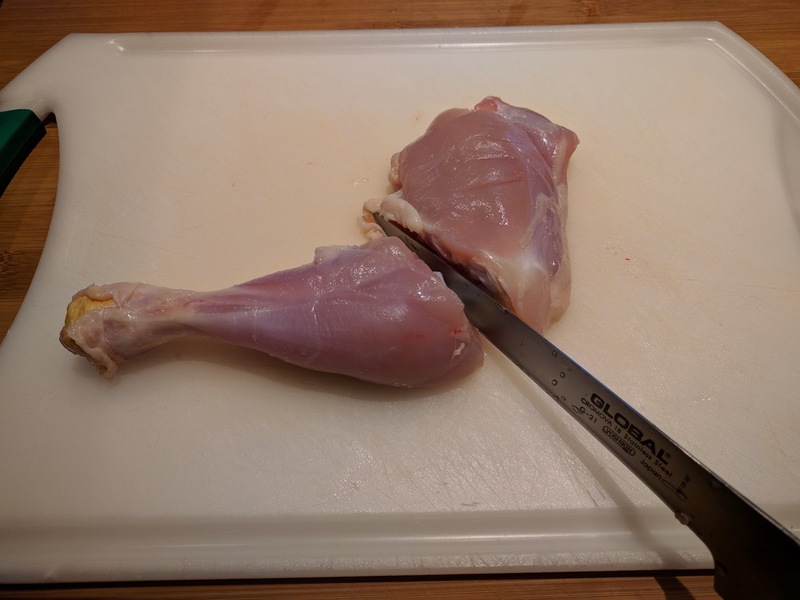 Cut the chicken into parts in order to save some room in your pan. Peel and cut the vegetables in large dices. Add all ingredients and 2 liters of cold water to the pot. Make sure you do not fill your pressure cooker for more than 2/3 of its capacity. Close and secure the lid and bring the pan slowly up to steam over med-high heat. The cooking time starts once full pressure (12-15 Psi) is reached. Check your pressure cooker manual for exact instructions. Cooking time is 45 minutes. After that, remove from the heat and let the cooker depressurize naturally. 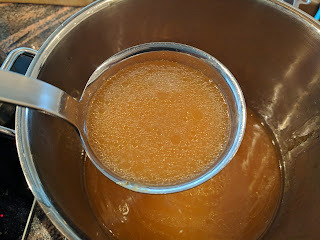 Do not use rapid release because that would cause the stock to boil and become cloudy. Remove all solids using a skimmer. 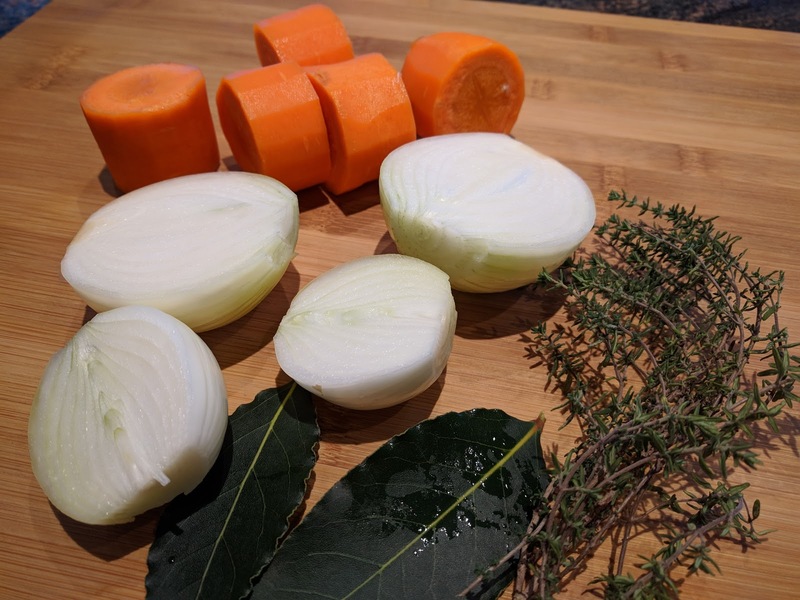 You can reserve the meat, It will have lost most of its taste, but it can be used in dishes with other flavorful ingredients such as a curry or chicken fried rice. 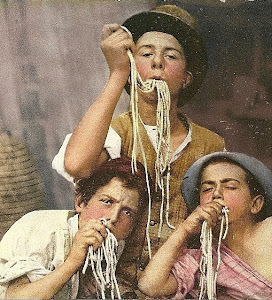 And of course in a soup, together with your stock. In that case add salt & pepper, fresh, finely diced vegetables and some fresh herbs. Collect into a colander and return the drippings to the pan. Optional: pour the stock through a fine-mesh sieve. Also optional: remove all fat floating to the surface. We actually reduce the stock a bit more by approx. 2/3 to save space in our freezer. Add water back again once you use the stock. Move to smaller containers and let cool to room temperature. 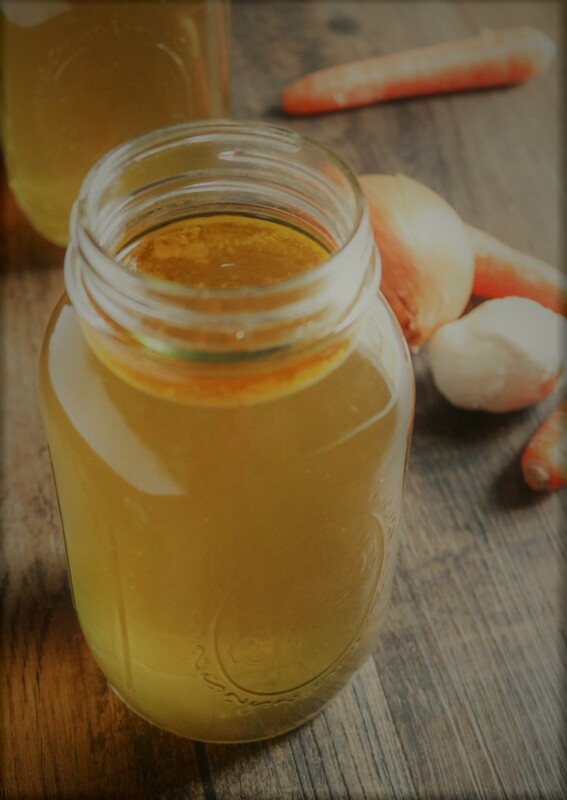 This stock will keep for several days in you fridge and half a year in your freezer. Use a zip-lock bag for maximum efficiency storage! 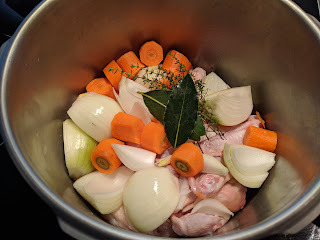 And here it is: just under two liters of hearty chicken stock in less than one hour. This golden chicken stock is very versatile and easy to make. Hearty, full of chicken flavor yet very clean tasting. Season to make broth, clarify to make consommé, or reduce to make sauce, jus, demi-glace or thousands of other dishes.